If you do not want to spend the money on a complete new oil pump, or the pump for your engine is not available (such as Scout II or the 1974-75 pickups & Travelalls), then this is the next best thing. 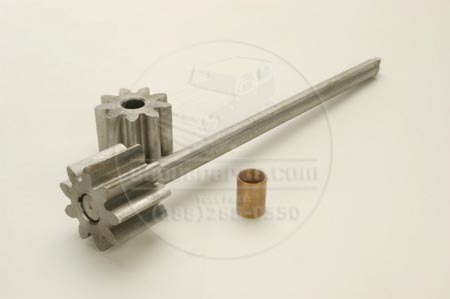 This kit comes with two new gears, a new shaft, a bronze bushing to press into the housing, and instructions. You will need to lap your gears and/or housing for proper clearance and to get rid of any scoring on the cover, but once you are finished, your pump will be as good as new. For proper fit, you should order some Plasti-Gage and emery cloth. Call us for those items too.